How are Listening and Reading Related? As humans, we have so many important ways we convey and understand information as we communicate. We are born with ears, and are never actually taught how to listen—it’s understood how to do it, we just start. As kids we grow up learning how to speak by listening to the people who are close to us, and imitating others. Almost everyone enjoys listening to radio, watching videos, talking on the phone. All of these things help to grow these skills, just by doing them repetitively, but how often do we focus on the these skills that we take for granted? How often do we consciously think that we are learning to read when we listen? The other language skills such as reading and writing are things that we have to be explicitly taught. Researchers have found that the four language skills: listening, speaking, reading and writing are all integrated and contribute to one’s understanding of the world around them. Reading and listening are receptive skills; writing and speaking are productive skills. And according to research, there are substantial correlations between these four language processes. 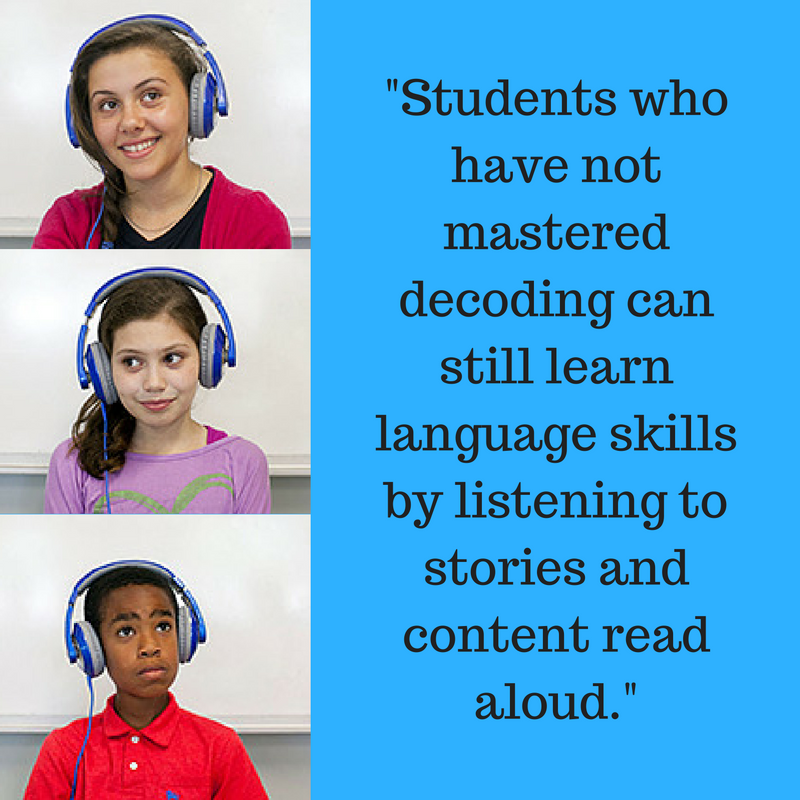 So when students are listening they are also advancing their other language skills. While listening and reading share many comprehension processes, there are differences in the way the information is processed. Readers often remember more details and can go back to the text. Listeners construct understanding as they listen and often come away with an overall understanding of ideas (Absalom and Rizzi, 2008). Students who are successful at reading comprehension understand at the sentence level as well as at the understanding the text as an integrated whole (Perfetti, 2007). Reading comprehension involves both decoding print and understanding language. Once students can decode text, their comprehension is dependent on understanding language. (Catts, Hogan, and Adlof, 2005). Students who have not mastered decoding can still learn language skills by listening to stories and content read aloud. Students can listen on a higher language level than they can read, so listening provides a way to improve students’ language skills, making complex ideas more accessible to students and exposing them to vocabulary and language patterns that are not part of their everyday speech (Fountas and Pinnell 1996). For example, students may be able to listen to and understand the plot and character development of Don Quixote and his inner journey, but not be able to decode enough words on their own to make sense of the content while reading. Language skills are essential in creating a mental representation of the whole text to understand it. Higher-level language skills can be developed by listening to stories. This develops language skills in all students, even those who struggle with decoding. Therefore, listening can be used to develop these essential language skills with students of all reading abilities. These language skills can then influence and enhance their reading comprehension. For example, when teaching the comprehension skill of compare/contrast, students can listen to a story about the traditional view of Genghis Khan as a conqueror and compare that to an author’s view of Genghis Khan as a visionary. Students can learn to use high-level comprehension skills by listening to the content and working with the concepts. Literal Knowledge: Students need to recall descriptions, facts and details to understand the meaning. This includes understanding information that is explicitly stated. Vocabulary: Students who understand content as a whole are able to construct a mental model of the story. This allows them to find the meaning of unknown words by interpreting them within the context of the story. They are more likely to choose the correct meaning of words with multiple meanings, as well as discover the meaning of words by using the context. Also, when they hear idioms and figurative language they are able to understand them within the whole context, rather than as individual words. Inferencing: Students who have high comprehension make inferences as they listen, connecting pieces of text together. They fill in missing information from their prior knowledge and experience, and go beyond the literal meaning of the content (Bowyer-Crane & Snowling, 2005). Main Idea: When listening, students generalize the content as a whole and identify the main ideas of the information presented. They interpret the information and how it all contributes to a main topic or issue. Summarizing: When students are asked to summarize what they heard, they identify the importance of each detail and retell the key points of information and explain how they contribute to the overall ideas. Analyze Point of View: Students listen to identify and evaluate the speaker’s purpose and main ideas. Evaluating Reasoning: Students evaluate the reasoning , credibility, and relevance of a speaker or author’s ideas and information. After seeing the connections between the four language skills, we see the importance in teaching and assessing listening and speaking skills in schools. By growing one skill, students are developing their other language skills. There is strong evidence that higher-level language skills are critical to good reading comprehension and its development. These higher-level skills play an important role in a reader’s or listener’s construction of the meaning of a text. Each of these skills can be taught and assessed in students of all reading levels, by using high-quality listening resources. Developing and practicing these skills while listening can contribute to increased comprehension when reading. These skills can be taught through targeted instruction, discussions, and monitoring progress to meet the needs of all students. Catts, H. W., Hogan, T. P., & Adlof, S. M. (2005). Developmental changes in reading and reading disabilities. In H. W. Catts & A. G. Kamhi (Eds. ), The connections between language and reading disabilities (pp. 25-40). Mahwah,NJ: Erlbaum. Bowyer-Crane, C., & Snowling, J. (2005). Assessing children’s inference generation: What do tests of reading comprehension measure? British Journal of Educational Psychology, 75, 189-201. Hogan, T. P., Bridges, M. S., Justice, L. M., & Cain, K. (2011). Increasing higher level language skills to improve reading comprehension. Focus on Exceptional Children, 44(3), 1-19. Perfetti, C. A. (2007). Reading ability: Lexical quality to comprehension. Scientific Studies of Reading, 11, 357-383.